The Hanging Gardens of Babylon are the most controversial of all the Seven Wonders because some archaeologists doubt that this Seven Wonder ever existed. After exploring the ruins firsthand in Iraq and reading extensively, I believe they did exist, but on a less grand scale than widely thought. The most popular account is that King Nebuchadnezzar II (of biblical fame) constructed this wonder in the 6th century BC to please his wife. Babylon's flat desert-like landscape made her homesick for the verdant mountains of Media where she was reared. So, the king built an artificial, terraced hill lushly cultivated with trees and flowering plants. 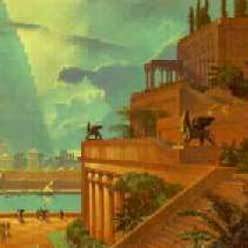 Another says that a powerful Assyrian queen built the Hanging Gardens of Babylon for her own pleasure. Others believe this Seven Wonder was conceived much earlier by an Assyrian king. Yet other experts go so far as to think that the Hanging Gardens existed in Nineveh, not Babylon.